Melanie Kelly: this is an edited extract from the forthcoming book Take Flight: Celebrating Aviation in the West of England Since 1910 which will be published by Bristol Cultural Development Partnership as part of the BAC 100 celebrations in July 2010. In setting up his business in the West of England in 1910, Sir George White provided the latest stage in over a thousand years of aviation history based in and around the city-region. The pioneers who preceded him were a fascinating collection of eccentrics, one-offs and genuine innovators. Among these were King Bladud, legendary founder of Bath, who was said to have learnt to fly using feathered wings as part of his exploration of magic and necromancy. Eilmer, an eleventh century monk at Malmesbury in Wiltshire, made a partly successful glide from the abbey tower using wings that may well have used Somerset willow covered in ecclesiastical cloth, and whose subsequent crash landing was attributed to 'the want of a tail'. 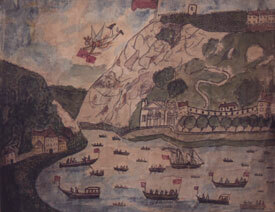 The experiments with kite-power of Bristol's George Pocock, schoolteacher and evangelist, included the 'charvolant' kite-drawn carriage (capable of carrying six people at 25 miles an hour), lofting his daughter from the bottom of the Avon Gorge to the Bristol Downs and touring the islands of the Bristol Channel by kite-propelled boat. The gorge was also the scene of Courtney's great Flying Leap in 1826. Billing himself as The Great Funambulist, Courtney slid down a wire from the top of the Clifton cliffs to the river on the other side of the gorge, complete with rockets firing from his side, giving the illusion to the crowds below that he was airborne. Another quirky character was the mysterious Steeple-Jack who, in the 1860s, once stopped by in Bristol and used kites to reach the tops of smoking factory furnaces so that he could repoint them. More influential, in terms of the development towards the aeroplane, were William Henson and John Stringfellow who were based in Chard, Somerset. They were inspired by the work of the aeronautical thinker Sir George Cayley, sometimes referred to as the Father of Aviation or of British Aeronautics, whose brief trials with a manned glider had proven artificial flight was at least theoretically possible. Henson and Stringfellow were both manufacturers involved in the local lace trade who shared an interest in powered, fixed-wing (as opposed to moving-wing) flight and discussed ideas on how this might be achieved. On 29 September 1842 Henson was granted provisional protection for his patent for an Aerial Steam Carriage, a passenger-carrying steam-powered flying machine. The completed specification was filed on 28 March 1843, by which time he had moved from Chard to London. Stringfellow suggested that he and Henson build a model version at their own expense while they tried to raise funds for the full-scale project. The extent of Stringfellow's involvement in the original patent is unclear but it is generally accepted that he at least improved the design, particularly with regard to its engine. Henson and Stringfellow conducted their experiments between 1844 and 1847 with limited success. However, although they never managed to get their model to make a sustained flight, when it was exhibited at the Science Museum in 1907 Henson was credited in the accompanying panel as the inventor of the aeroplane. The model lacked a facility for maintaining lateral stability (for example, wing warping, ailerons or flaps) but had many features found in modern aeroplanes including propellers, rudders, elevators and a wire-braced structure. Henson abandoned the work and emigrated in 1848 to America where he later tried his design at airship design. 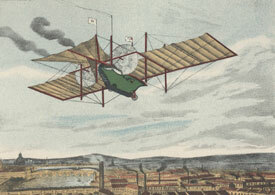 That same year, Stringfellow, who had continued his research alone, gave his own steam-powered model its first trial flight at Chard, covering a distance of about 12 metres (40 feet). With further developments the model was able to sustain distances of over 36 metres (120 feet) at trials at Cremorne Gardens in London. The model was able to climb under its own power once it had detached itself from its launch wire, leading to claims that this was the world's first self-supported, power-driven flight. On 27 June 1866 Francis Herbert Wenham, a marine engineer who had worked in Bristol, delivered a paper entitled 'Aerial Locomotion' at the first meeting of the Aeronautical Society of Great Britain. In the paper, which he had written seven years earlier, Wenham explained why a long narrow wing was the best type for providing lift and that if wings were superimposed (set one above the other) the lift would be maximised. Wenham's work inspired Stringfellow to resume his own experiments for the first time since 1848. He submitted a working model demonstrating Wenham's principle of superimposed planes to the UK's first Aeronautical Exhibition held at the Crystal Palace in June 1868. He also exhibited a steam engine which won the Aeronautical Society's £100 prize for the lightest engine in proportion to its power from any source. Although unable to demonstrate a free flight because of the lack of space, witnesses at the exhibition reported that the wire along which his propeller-driven triplane travelled was seen to rise, suggesting the possibility that the model would be able to gain height under its own steam, as it were, in the right conditions. Stringfellow used his prize money to build a dedicated workshop where he could continue his experiments but failing eyesight curtailed his plans. The Henson-Stringfellow model was purchased for the nation and donated to the Science Museum by another West of England figure in the field of aviation. This was the well-connected Patrick Alexander, a philanthropic aeronaut from Bath. Alexander poured his inherited wealth into visiting aviation experts and spreading word of their achievements around the world, having, at that time, the leisure and money to indulge his passion. In addition, he became a member and patron of various aeronautical clubs and societies. 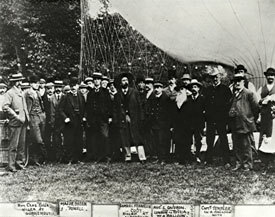 In September 1902 he organised a gathering in Bath to celebrate the centenary of the first balloon ascent from the city. His guests included some of the country's leading aeronauts, among them Major Baden Baden-Powell, President of the Aeronautical Society, showman Samuel Cody, who was a man-lifting kite flier and later designer/pilot of the first powered aeroplane to fly in the UK, and Charles Rolls, motor car promoter and aviator. He took the opportunity to show the group his experimental workshop at Batheaston where he was developing propeller-driven gas balloons and a wireless telegraphy system, among other items. They also saw a demonstration of Cody's war kites at Bannerdown. During the First World War, Alexander volunteered to promote the military value of aviation on both sides of the Atlantic, and was appointed to the Meteorological Office at Falmouth by the Air Ministry. However, by the war's end, with his inheritance exhausted and his ideas overtaken by the developments in flight achieved by others, he was no longer a man of influence. He ended his days as a teacher of aeronautical engineering at the Imperial Service College, Windsor, of which he had been a benefactor. He died in poverty and his name was soon forgotten outside a small specialist circle. He does, however, retain a physical link to modern aviation as his original experimental workshop at Combe Down is now part of the site of Cross Manufacturing, specialists in seals used worldwide by the aerospace industry. The company was founded by Roland Cross, a former employee of the British & Colonial Aeroplane Company, who knew Alexander as a child. 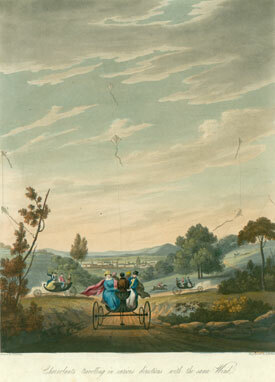 'Charvolants travelling in various directions with the same wind' from George Pocock's The Aeropleustic Art, or Navigation in the Air by the use of Kites or Buoyant Sails, 1827 (Special Collections, Bristol Central Library). Depiction of Courtney's leap, 1826 (Special Collections, Bristol Central Library). Artist's impression of Henson's Aerial Steam Carriage reproduced in M J B Davy's Henson and Stringfellow, 1931. Photographs of Stringfellow's 1848 and 1868 models reproduced in M J B Davy's Henson and Stringfellow, 1931. Gathering of aeronauts in Sydney Gardens, Bath, 1902 (Rolls-Royce Heritage Trust).